Our solutions deliver intelligent experiences in banking, payments, engagement and security – experiences that help more than 12,000 banks, credit unions, billers, mortgage lenders and leasing companies, brokerage and investment firms, and other business clients provide financial services at the speed of life. •Open Banking is the start of a new pace of change. The race to get compliant with PSD2 is really a race to the starting line. •Open Banking is more than a compliance project. It is a massive opportunity to integrate financial services into consumers everyday lives. •Making the most of the opportunity requires Banks to think beyond Day 1 compliance and set themselves up to stay compliant while freeing up resources to maximise the opportunity of Open APIs. 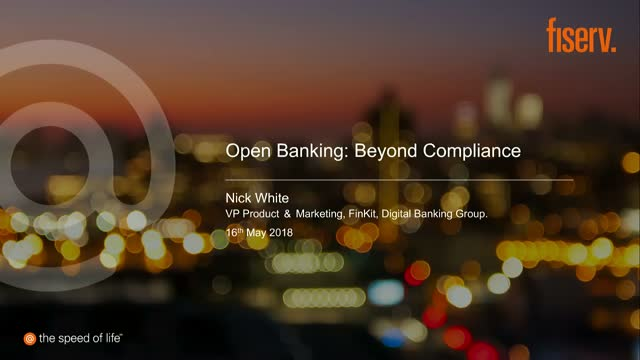 •In this session, Nick White, VP at FinKit will explore Open Banking use cases and the capabilities and operating models required to win in this exciting new phase of Open Banking.